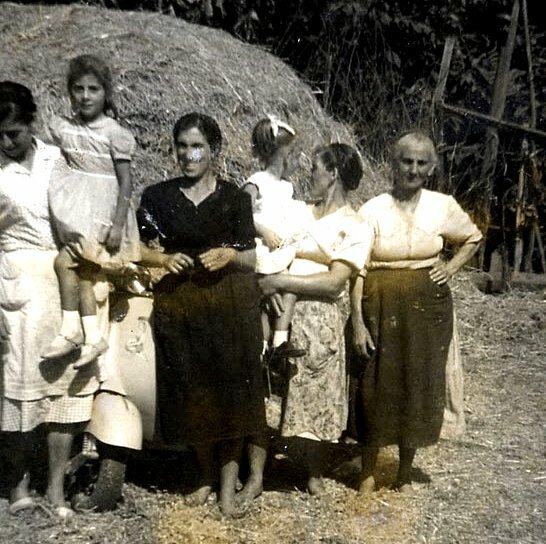 my grandmother, great aunts, mother, and relatives on the family farm during the yearly wheat harvest. A style of cooking best represented, in the past, by the lower class (read: peasants) of a given society. Peasant cooking aims to utilize whatever is found in the kitchen, household, farm, etc. to prepare meals. The concept of cucina povera (literally meaning poor kitchen) can be found in every society and is really about making great food with simple, yet high quality, and available ingredients (including every part of the animal such as cow intestine, pig ears, goat head, etc.). Both my family in the United States and Italy have made, and continue to make, meals in the fashion of cucina povera. That is to say, utilizing both what is contained in the kitchen or pantry and what isn’t too costly at the market in order to prepare meals. In Italy, the kitchen of the poor came out of post War conditions and the generally depressed state of southern Italian life where food choices were limited (regardless of War). Ask any Italian cook if they aim to prepare foods in the style of cucina povera and you’ll get a laugh, especially from an older person who lived through post War Italy. Both my grandmothers, for example, wouldn’t acknowledge the cucina povera style rather they argued that it was simply the food they had access to and prepared (we’ve only managed to romanticize the style of cooking here in the United States with our countless food choices). So, my simple advice if you’re looking to cook in the style of, say, the Tuscan peasant or the Calabrian laborer is to keep an Italian pantry (see my list of the top 12 Italian pantry ingredients) that is well stocked and to try and lead a more simple existence (see the 10 things my Italian parents taught me about money); that is to say, cutting out excess and living the Italian way (in the kitchen and elsewhere). Two short stories to share- I tried making Poor Man’s Parmesan which is pasta with toasted breadcrumbs in place of cheese. well we burned the breadcrumbs. lol…kind of funny now. And my grandma made a dish that the family called “minestra” but it wasn’t a soup. It was dandelion greens, potatoes, lard or bacon fat, seasonings and polenta. As a child, it made me sick. I wish I could taste that dish now. No one seems to know how to make it in my family. You can use any greens, such as dandelions, chicory, escarole, separately or all together. and then add cooked greens and potatoes. There you go!! Your meal is ready! Michelle, interesting recipe – thanks for sharing! Vincenzo: listen to your grandmothers: cucina povera is the cuisine of the ordinary Italian, pre- and post war. We ate what the land provided; occasionaly, with the little money that came from our fathers in America, we would buy meat. Calabrian food was rich with greens, beans, home-made pasta and, when available, pork–we all had pigs; also goat and wild birds and rabbits, when my brother-in-law caught them. We did not consider it “poor”. When we came to America we continued to eat much the same foods, except we added chicken, which was plentiful and relatively cheap. I worked in an Italian restaurant during the war in Brooklyn, the only Italian food that was known was “Neapolitan”. Fortunately, the owners were Tuscan and introduced me and my fellow workers to Northern Italian cooking. It was a long time before Americans, and most Italians, learned that there were other kinds of Italian dishes. Now everybody things Northern Italian cooking is “Italian food”. The other truth about cucina povera is that there are no rules: each of us make the dishes in our own unique style. Great comments and we always aim to listen to our grandmothers and mothers! You are correct about how insular regional Italian cooking was certainly pre-War and to a certain extend post-War (up until the late 1970’s). I’m afraid most cooks in southern Italy “cook” well outside of the region. Are there good books on how to cook and live like this? I have heard that some of the peasants with the least amount of meat/saturated fat are the healthiest in the world in the Mediterranean. Linda, you must have had a great childhood! I’m from Brescia and my mom and her mom cooked like this! I still make polenta and a soup made from bread crumbs, plus white riso with parmesan cheese and browned butter was my childhood favorite and I still eat it. Those items sound wonderful! Brescia is beautiful. Maria, that must be a great tasting sauce. My grandmother would make a tomato sauce from chicke n parts (leftover parts of course). I certainly grew up with the cucine povere giudecca! However, if you are povere, quality of ingredients has nothing to do with it. That is a yuppie revision. You use what you can get. I have about a dozen Italian cookbooks, and one of them has a recipe for melanzane povere, but unlike Lidia’s recipe, it has anchovies in the sauce, sauteed and broken down. I can never find the book it is in when I want it! The same for pasta puttanesca. I look through all the indexes and cannot find it! I have cookbooks by Catanzaro, Romagnoli, Hazan, Boni, Bugialli, Better Homes and Gardens, Woman’s Day, Culinaria, Silver Spoon and a few others. The Romagnoli’s and Boni are my favorites. My mother used a lot of dried herbs to make delicious whatever she was making, whether meat loaf or potatoes. Thanks for the comments. You are correct that the quality of the ingredient in the true cucina povera wouldn’t matter (expect of course if the family was lucky enough to own a small piece of land). My grandparents in post war Italy were lucky enough to have a small farm and the ingredients coming out of the farm were pretty exceptional, even during bad times! Hey we may have been poor but we are healthy eaters.